It was a robot! It slowly walked out of some… gas? A few minutes later it was scrap metal, but what was that noise?! It was… laughter! A voice said “ha ha ha ha ha! You can’t stop me – and in a few days I will rule the Universe! Ha ha ha ha ha…” “B… b… but how?” asked Jack. “You will see – I will test it on you” replied the voice. Then there was a click. Suddenly a giant robot smashed a wall down! “This will be easy; it’s such a large target” thought Jack, and he fired his gun at the robot. But the giant robot rolled up into a ball, disappeared, and instantly reappeared somewhere else, unrolled, and fired a shot. “Okay okay, maybe I was wrong” thought Jack. The shot hit jack’s plane and blew both his and Blackface’s to ashes instantly. Suddenly Jack remembered the minefield. He led the robot closer and closer until… KABOOM! But for the robot that was like being hit gently by a tiny spark from a tiny fire! And when the roof caved in on it, Jack and Blackface had to dodge the boulders that were like tiny grains of sand to the robot. They tried a lot of other things, but none worked. Then Blackface had an idea. He set off the fire sprinkler. 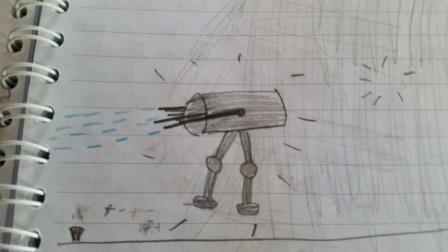 But it did nothing; the robot was waterproof. Then Jack had another idea. He would phone the brown “H” and tell them to come. But meanwhile they would have to fight off the robot on their own. Then the voice spoke again. “this is only one of millions being built. They are not finished yet; but they soon will be” it said.